‘The Animals And Children Took To The Streets’ is written and directed by Suzanne Andrade, with film and animation by Paul Barritt. It is performed by Felicity Sparks, Genevieve Dunne and Rowena Lennon, with additional voice work by James Addie. 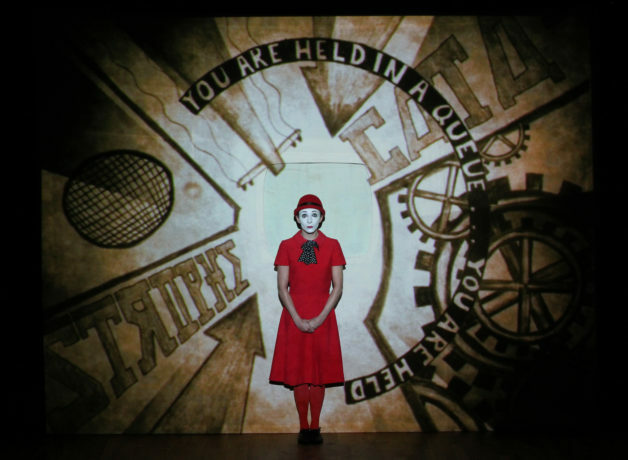 The production company ‘1927’ was founded in 2005 by Suzanne Andrade and Paul Barritt and, since 2007, has shown its work in 40 countries and is now an Associate Company of HOME Manchester. 1927 specialises in synchronizing performance and live music with animation and film. ‘The Animals And Children Took To The Streets’ is set in the fictional Bayou Tenements of a fictional, unnamed city and principally follows the trials of Agnes Eaves, her daughter Evie Eaves and the charmingly pitiful Janitor, while also taking care to drop more than a few pointed socio-political remarks. Particularly with the side characters of Zelda and her mother. It was a delightfully dark and surreal production. The set design itself was very simple; three tall screens with rear and front projection used to brilliant effect. 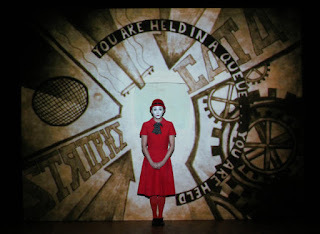 The animation and illustration by Barritt were projected onto the screens creating ambitious, moving set pieces in a relatively small theatre space. The innovation in this presentation is wonderful: from birds-eye view dream sequences to the puffs of cloud as a live performer swept the stage or sprayed cockroaches. The production design, lighting, animation and costume design were beautiful and leant heavily on the style of 20s German film and late 19th Century Art Nouveau; think Théophile Steinlen. The live music was also a lovely touch and there were some rather catchy tunes. This is not by any stretch a musical with only two significant songs, though one did have a few reprises. The performers did flawless work here, carrying several characters each, with numerous costume and scene changes without a single noticeable error. The performance also included a narrator and the clipped RP delivery reminded me very strongly of Oliver Postgate; narrator of Bagpuss and Noggin the Nog. All in all this is an incredibly well-rehearsed, confident production. The transitions and movement are flawless and feel simple but I wouldn’t be surprised that they were more challenging than they looked. ‘The Animals And Children Took To The Street’ is an absolute joy, even if the humour is dark and we were told right from the start that there would be no happy ending. It is showing at HOME Manchester until Saturday 16th February and I strongly encourage to make the time to see it. REVIEW: The New Romantic - The Vaults, London. REVIEW: Blue Öyster Cult - The Brudenell, Leeds. REVIEW: Bodies - The Southwark Playhouse, London. REVIEW: 2084 - Central Library, Manchester. REVIEW: Outspoken - Number 70, Manchester. REVIEW: Punk Rock - The DPL, Media City, Salford. REVIEW: Annie - The Opera House, Manchester. REVIEW: Bouncers - Hull Truck Theatre, Hull.